Kat's 9 Lives: Yummy! Alien Fresh Jerky! Tastes Just Like Chicken! Yummy! Alien Fresh Jerky! Tastes Just Like Chicken! Of course it tastes like beef jerky because it IS beef jerky... or so they say! O=P I always stop off at the Alien Fresh Jerky right by the Mad Greek. If you ever drive to Vegas, there are two things you definitely need to do. 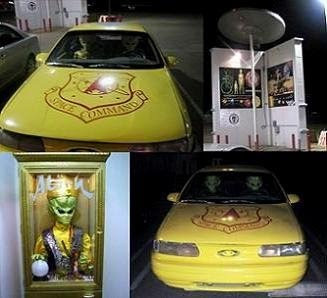 One, get some yummy "alien" jerky and continue driving towards Vegas to go to Primm's Outlet! ^_^ Or any of the outlets in Vegas, but my favorite is still Primm's. Although this time around I couldn't find anything I like and was upset by that. It's better to go there when it's not busy and NOT July 4th weekend! Back to some yummy snacks. 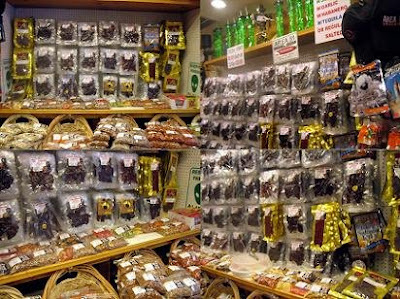 They have a variety of spicy and sweet flavored jerky. It's sort of like a small Casa de Frutas, but with meat! Yum! The jerky is quite costly, but isn't all good jerky? It's 3 for $20 and you can mix & match. I really liked the Peppered Jerky this time around because it was very flavorful with a kick! This time they moved locations and changed some of the flavors as well as ran out of some different types. They must be popular! It's just a really cute place to go and check out. You got to love the tacky aliens decked out everywhere. Ms. Lin finds them a little creepy, I just think they are funny. When they get more jerky back in stock, you need to try the Buffalo Jerky and Southwest Jerky. Hopefully when I go back next week they will be back in stock.